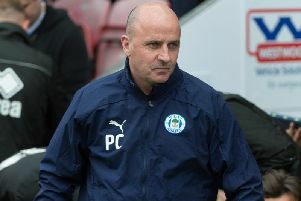 Paul Cook admitted Wigan Athletic were left to pay the penalty for being on the wrong end of a couple of debatable spot-kick calls in the 2-1 defeat at Portsmouth. Latics lost ground on Blackburn and Shrewsbury in the late kick-off on Easter Monday, with Will Grigg’s 89th-minute effort coming too late to make a difference. Pompey had taken a firm stranglehold on the game with two goals in the space of 15 minutes either side of half-time, through Brett Pitman and Jamal Lowe. Pittman’s goal came from the penalty spot after Dan Burn was adjudged to have tripped Ben Close on the edge of the box. With Latics having earlier been denied a seemingly stronger shout for a spot-kick - when a Nick Powell free-kick was clearly handled by at least one defender in the Pompey wall - Cook was left to choose his words carefully in the aftermath. “I thought it was a really good game, and a really good atmosphere inside the stadium,” the Latics boss said. “We felt we were in control of the game, but then they scored goals at good times. “The penalty decision is a big decision - and we felt we might have had a penalty in the first half ourselves - but that’s part and parcel of the game. “I certainly couldn’t fault the effort or the work ethic of our lads. It was all Latics in the final quarter, with Powell hitting the bar, Grigg forcing a superb save out of Luke McKee and Ryan Colclough steering wide from close range. “Powelly started getting in, Griggy had a couple of efforts, Ryan’s had a good chance,” mused Cook. “We really thought we could come here, play well, win the game and stamp a bit of authority on the division, but it wasn’t to be. “It’s just another game, we’ve got another eight to go, and there’ll be more twists and turns ahead. “That’s the nature of football, and you just keep going until the end of the season. “We’re disappointed now, but sometimes it’s really good to taste that disappointment, because it can spur you on.